I wanted to get a beautiful photo up to replace the house dropped on the Wicked Witch of the East from the previous post. ;) I'm pretty sure this space is one of the most incredible I've ever seen. Windsor Smith is amazing. I'm not going to go over all of the details, but in short, I think it's perfect. Thanks everyone so much for the kind words yesterday & I know so many of you are in the exact same boat. I hate to get all mushy, but I will because I realized something and I think it's worth mentioning, My mom came over yesterday to help with the kids (like she does twice a week) and she could tell I was feeling overwhelmed. She was sitting on the sofa and said, "Aw, come here" and I did and she just hugged me like a kid and I got a little teary and felt better. I have to say I definitely thought I was past that "mom-makes-it-all-better-with-a-hug-thing," but I'm not. It still works. She helped clean the (terribly-messy/ trashed) house and stayed late to babysit the kids so I could take Dave out for his birthday dinner. It's pretty amazing what moms can do and I'm so thankful for mine. She swooped in and fixed me just when I needed her. And since I've already gone down the emo-road today, I have to mention that my husband does the all-better-with-a-hug-thing and it always seems to work too. Amen to your last post and this one too. What would we do with out those magic hugs?? You are really lucky to have your mom nearby. What I would give! Actually, my parents are coming to visit for a week and a half starting this weekend and I couldn't be more excited!! Mothers are like that. A mother will always be a mother, the lioness, protecting her young ones even when they have grown up! What a lovely picture, so warm..
Moms are the best, my mom can make me feel better even from far away. My biggest supporter. Sounds like yours is too. Loving those cute kids... especially that dangling baby! Wow, your mom looks so young! I am 40, and I feel like she looks like she is around my age, which scares me because I guess theoretically I could have a grown daughter instead of a toddler! Love the lines of the ceiling outcropping at the right of the photo...it would be great to see this room in person. Glad your mom is nearby, it does make all the difference!! I don't know what I would do without Mom. I'm glad to hear that yours was so close at hand just when you needed her. Love your picture! A mom will always be a mom...and we will always want to make it better! :-) I totally understand where you were...I was in a totally different city from any family with 2 little ones and no one to help, even their dad. :-( One of the most difficult times of my life. I am so happy that your mom can stop by and help...I know that is her great pleasure to do so. Hang in there! 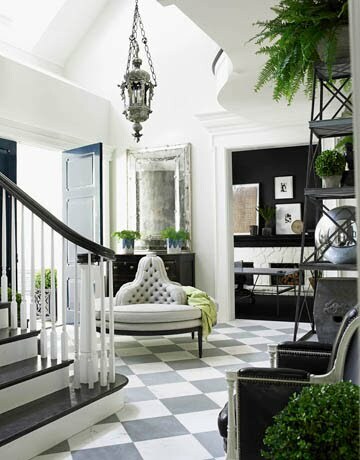 I love that entry way - what magazine was that in? I get every home one, maybe I haven't seen it yet. Does anyone know. Sometimes a warm hug from the right person does wonders. Please don't stress yourself trying to do everything for everyone. I think you are doing an amazing job with your business while also be a mother and wife. You should be proud of yourself. P.S. I've always loved that entrance. Just divine. Yes, mom's and sister's do that! We need them and it's wonderful that you are able to tell her and thank her! A hug from mom can make almost anything better, even if you're an adult or even mom yourself. Glad yours was there to help out yesterday. And yes, that Windsor Smith entrway is STUNNING. Love the blue-gray marble. Hang in there, you are in a really hard phase right now (mine are exactly the same distance apart as yours, both boys, too.) It gets easier and harder then easier-- but you are lucky to have family to lean on. No more getting squished by houses for you! You are so lucky to have your Mom nearby. Hubby hugs are always a good thing too (Mike gives me bear hugs - with sound effects!) but Mom hugs make you feel like you're ten again. What a lovely post. I have tears in my eyes. I know for me I have many interests (career, working out, goals for myself) but my greatest passion is being my children and husband. So I find life can be a little overwhelming at times when my desires to be good at some many things overpower my ability to do it all and do it all well. Sounds like you too...maybe? Beautiful photo of you, your mother and your children...that is a captured treasured moment! Beautiful post....and totally agree about moms making it all better. Mine lives about 2 miles from us....and it makes me sick to think about moving so far away later this year. My Dad already thinks she'll abandon him to be with her grandchildren! Glad you are feeling better and were able to get out sans kiddos last night. What a beautiul picture of you and your mom and family! Most Mom's are always willing to be there and be of help whenever they can...That's us just being a ~MOM~..
PS; TELL YOUR MOM LAUREN THAT SHE LOOKS TOO YOUNG TO BE YOUR MOM! This made me cry....and miss my Mom so bad it hurts. Luckily she is only 3 hours away. Such a great post, as always!!! Lauren, you're the sweetest! Love this post, and totally empathize about your last one. Life is overwhelming sometimes, but you have a beautiful and inspiring one. Keep at it girl, you're awesome! A hug a day keeps the gray away! So happy your mom was there for you. slithered out from under that shed...in style! you're so sweet. And you're lucky to have your mom in town with you! And you all look too cute- how can that be your mom?!! Aw, such a sweet post. That's exactly what moms are for. So glad yours was there for you when you needed her! Hang in there, girl! hehe. my husband who is 55 STILL leans into his mom - then she scratches his back softly while he is all mushed up in her spacious busom. truth. after she is done, he has this sleepy eyed grin on his face. gah. you never get over a mom's hug.